All DAYBREAK SPRINGHOUSE homes currently listed for sale in South Jordan as of 04/24/2019 are shown below. You can change the search criteria at any time by pressing the 'Change Search' button below. "SpringHouse Village, the new OakwoodLife 55+ community in Daybreak, is now open! Come and tour the 6 beautiful model homes. The Hyde floorplan is also one of our models. This popular plan features an arts and crafts exterior, 2nd bedroom guest suite; flex space on the main floor, stainless steel appliances, granite countertops, gorgeous cabinets and beautiful wood laminate flooring. Also included is a walk in shower in the master bathroom, fireplace in the great room. FULL YARD LANDSCAPING INCLUDED! This home is MOVE IN READY. Call now to show this home and visit the Community. Hyde Lot 126) "
"SpringHouse Village, the new OakwoodLife 55+ community in Daybreak, is now open! Come and tour the 6 beautiful model homes. This darling home, the Laurel floorplan features flex space and a loft upstairs. The elevation is a Colonial Revival exterior, and kitchen upgrades include stainless steel appliances, granite countertops, gorgeous cabinets and beautiful wood laminate flooring. Also included is a fireplace in the great room with a media center and a walk in shower in the master. FULL YARD LANDSCAPING INCLUDED! Call now to show this model and visit the site, this home is MOVE IN READY!!! ! (Laurel Lot 124) "
"Check out this MOVE IN READY HOME in SpringHouse Village, the new OakwoodLife 55+ community in Daybreak! ! Come and tour the 6 beautiful model homes. 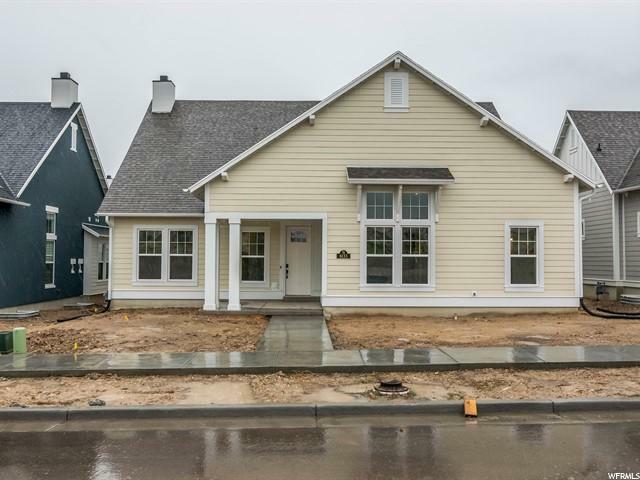 This darling home, the Elwood floorplan features a finished basement, flex space on the main floor. The elevation is a European Romantic exterior, and kitchen upgrades include stainless steel appliances, gray quartz countertops throughout, kitchen backsplash, gorgeous maple cabinets and beautiful wood laminate flooring. Also included is a fireplace in the great room and a walk in shower in the master. FULL YARD LANDSCAPING INCLUDED!! Call now to show this model and visit the site, this home can close in January 2019! (Elwood Lot 154) "
"Check out this Darling Rambler home in our brand new 55+ community in Daybreak. The Larimar floorplan is also one of our models. This popular plan features an arts and crafts exterior, 2nd bedroom guest suite; flex space on the main floor, stainless steel appliances, granite countertops, gorgeous cabinets and beautiful wood laminate flooring. Also included is a walk in shower in the master bathroom, fireplace in the great room. This home will be move in Ready in MAY. Call now to show this home and visit the Community. Larimar Lot 150) "
"MOVE IN READY BY MAY!! Come and visit SpringHouse Village, our new OakwoodLife 55+ community in Daybreak and tour our 6 beautiful model homes. We offer so many amenites, between pickle ball, a resort-style swimming pool, zigzagging bike paths, and lots of curated events. This darling twin home the Larimar, features a Victorian exterior, stainless steel appliances, granite countertops in the kitchen, beautiful kitchen cabinets and upgraded wood laminate flooring. Also included is a walk in shower in the master bathroom. FULL YARD LANDSCAPING INCLUDED!! This home is modeled in the community, Call now to set up a time to visit the community. (Larimar Lot 140) "
"Check out This darling twin home the Larimar, featuring a Victorian exterior, stainless steel appliances, granite countertops in the kitchen, beautiful kitchen cabinets and upgraded wood laminate flooring and fireplace in the great room. Also included is a walk in shower in the master bathroom. FULL YARD LANDSCAPING INCLUDED!! This home is modeled in the community, Call now to set up a time to visit the community. (Larimar Lot 141) "
"THIS HOME IS MOVE IN READY! Come out and and tour the 6 beautiful model homes in Springhouse Village, our 55+ community in Daybreak. This darling twin home the Topaz, features a European Romantic exterior, stainless steel appliances, beautiful granite countertops in the kitchen wood laminate flooring, and oversized eat-in island. Also included is a walk in shower in the master bathroom. FULL YARD LANDSCAPING INCLUDED!! Call now to set up a time to visit the community. (Topaz Lot 137) "
"TO BE BUILT HOME in our Daybreak 55+ Community. Come out and and tour the 6 beautiful model homes. This darling twin home the Larimar, is modeled in the community and features a European Romantic exterior, upgraded stainless steel appliances, beautiful granite countertops in the kitchen wood laminate flooring, and oversized eat-in island. Also included is a walk in shower in the master bathroom. FULL YARD LANDSCAPING INCLUDED!! Call now to set up a time to visit the community. (Larimar elevation A Lot 159) "